Kids, Cows and Grass: Ohhhh boy, what have I done now? Ohhhh boy, what have I done now? Well, I really stepped in it! I don't know what to think about it, but I did it! I moved to self-hosted and even changed the name of my blog that I have been posting for more than 5 years! I still have the same goals and the same plans, but I think my new name is more descriptive of my blog and how it has evolved. So, if you still follow me at Life on a Kansas Cattle Ranch, you need to update your bookmarks to "Kids, Cows and Grass!" That's www.kidscowsandgrass.com! I began blogging in 2009 to tell some stories of what happens on a ranch and to answer questions from people who don't live in rural areas. I think the conversation is changing and growing in the past 5 years. There are many more people involved in agriculture that are willing to answer questions. I also found that my blog posts are about three major topics: Kids, Cows and Grass! Those are my passions. I am first, and most importantly, a mom and a wife! I am so proud of my five kids--they are the reason I love what I do. They are nearly all grown now, and will be moving out of the house (hopefully) this fall. I know they will return to help with ranch chores from time to time, and to work at home for the summer. People ask me what I plan to do as an "empty nester" and I smile and say I have PLENTY to keep me busy! I will desperately miss these kids and their smelly sneakers, late night basketball games, help with the chores of ranching and their great sense of humor--each one of them can make me and their dad laugh! But they are supposed to grow up! This is what I've been working for!! And I will always be their mom. I can still tell stories about their childhood, embarrass them with naked baby pictures (and blog posts of their adventures) and watch as they mature into hard working, good-for-society kind of people. And I still have my cows. I know that sounds nuts...but I do love cows! They have personality; they listen when I talk; they (mostly) do what I ask of them; and they provide me with a lifestyle that I love--living and working in a small community, spending my days outside. Not my photography...but it is beautiful! I am trying to find out the original photographer to give them credit. I'll update when I have it figured out! That brings me to my other passion--the grass. 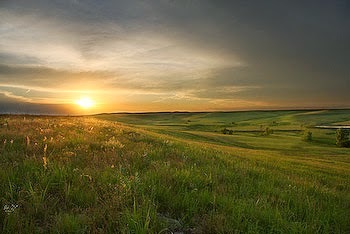 I've written before about the Kansas Flint Hills. I am desperately passionate about this grass and the land around me. It is nearly all in grassland because the pioneers found it was too rocky to farm. There is plenty of good farmground around us, but the bulk of the land is in the same grass that the buffalo ate centuries ago. It is still here because of people like me, taking care of it, removing the invasive plants and caring for it so that it will still be a fertile land for my kids and grandkids. And that brings me full-circle. Back to my kids. So really, this is the perfect name for my blog. Kids, Cows and Grass. This is me. This is my passion. I hope you enjoy reading about it. I ask you to share it with your friends...and update your links!! Congratulations Debbie on making the big leap to self-hosted! Blogging evolves and your passions are fantastic pillars of who you are and will live on here. I am excited to see you at Blogher and chat again in REAL LIFE. See you soon! Thanks, Katie! Blogher is so exciting!! I am already overwhelmed by the connections and fun! See you there! Congrats on the BIG JUMP. Something that I would like to do some day!! I love reading your posts. Just plunge in, Kristin! No better way!! Congratulations - I am so excited for you and the new developments! I'm so happy for you I'm bursting at the seams! Brandi, you always make me smile!! Now, to get my new business cards printed to head to BlogHer conference and make lots of new friends!! So very proud of your family, Your new blog describes your beliefs so much better!